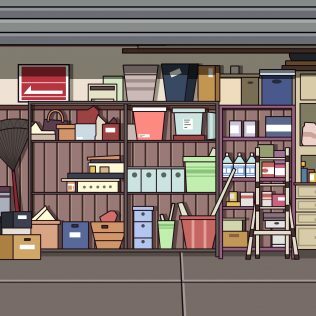 In many homes, the garage, first looked upon as a safe haven for your car – a place to keep your precious vehicle protected from harm and warm so you never have to scrape windows, even in the depths of winter – has become a black hole of house hold goods that have been relegated to storage, in hopes that they’ll be used again one day. When the boxes are stacked to the ceiling and junk you’ve accumulated is piling up, the idea of cleaning out your garage can be overwhelming. Research says that only 30% of Americans keep their cars in the garage. Now that you’re ready to use yours, where do you start to reclaim your space? The easiest way to tackle the clutter is to begin by sorting it into three piles. Peter Walsh says that “Stuff goes in and never comes out.” It’s important to remember that keeping these items is what got you here in the first place, so take the time to consider if you really need each item. What’s more important to you, having something that’s already been sitting in your garage too long or having the free space? You should only choose to keep the most important things in your garage, like family keepsakes, photos, and useful household items. If you haven’t used something in a year, it’s time to consider parting with it. If you choose not to keep something, you can then move it into the “trash” or “donate” pile. Many items can be donated, but make sure you’re choosing things that are useful and not mistaking garbage as donation worthy. Donations can be taken to a variety of places, like Goodwill, where the items will be resold to raise money for charity. You can usually find lists online of what various places need and will accept. One other option with items that you’re ready to part with but that are still useful is to sell them. If you have lots of things, you can host a yard or garage sale, or you can consider trying online selling sites like eBay or local selling apps or groups through other social media. The last option for things you’re looking through is to throw them away. Anything that can’t be used anymore, especially things that are broken, old paperwork that can be backed up digitally, and other non-useful items should be put into the trash or recycling bins. Once you’ve sorted out everything you have in storage, you can start planning what you want to do with your free space. Use your garage traditionally or decide to have your own art studio or band rehearsal spot. Once you know, you can start moving things in and arranging accordingly. For moving any donations or trash, rent a van or truck for the weekend to take care of everything in one large haul. Make sure that when you do move everything back in, you start storing your items in an organized, tidy, way. Label your bins and keep them neat so that you can get the greatest use from your new, clean, garage.